On the pages of the newly released GQ Magazine. Together as usual. 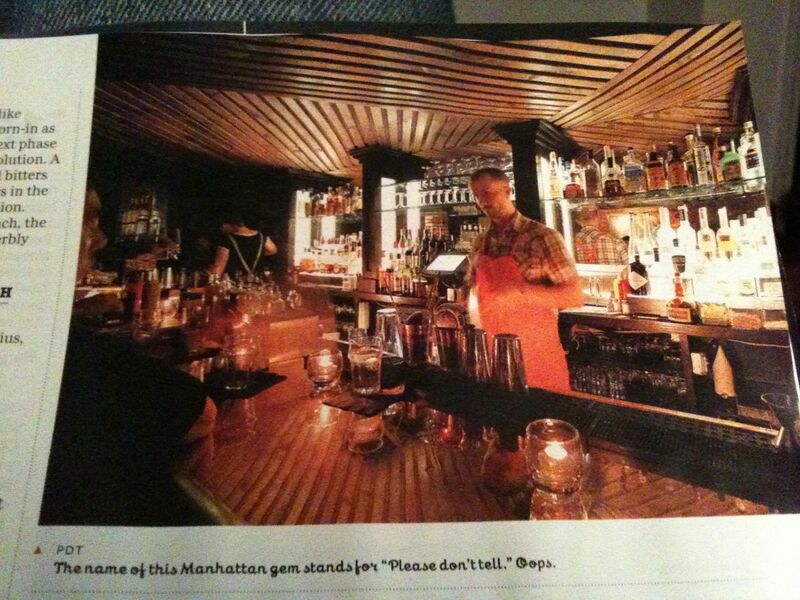 That’s Jim Meehan in the picture of our bar, the mastermind behind it all. Working, Running, Blogging, and Bathing. Unabashedly, I love taking baths, it always allows me to clear my head, relax my muscles, and spend some good time thinking about what needs to be tackled next. Whoever created the stigma that bathing was either feminine or sissy needs to take a bath, maybe it will let them spend a little bit more time thinking about the words that are coming out of their mouth. Here are a sampling of thoughts that were pondered during my most recent bath. 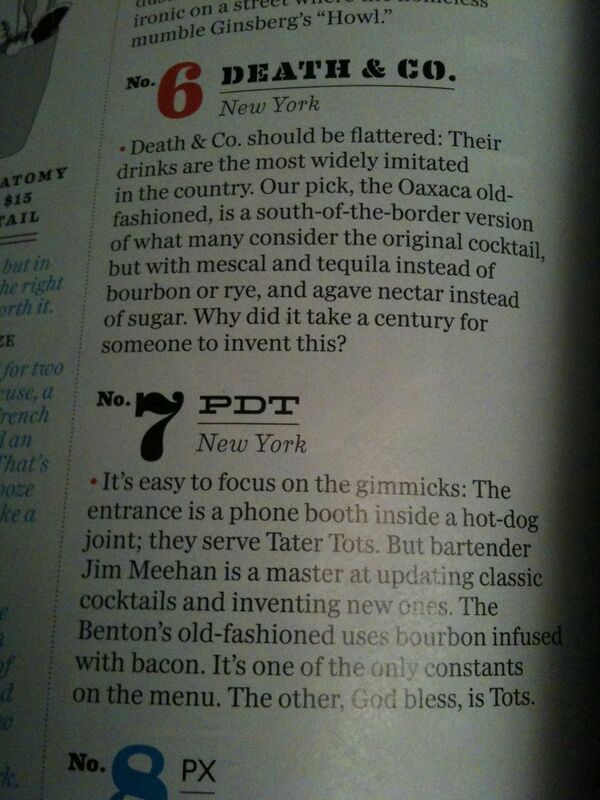 It is not a rare occurrence that I come across an article about Crif or PDT in some New York publication highlighting our cocktails and hot dogs. Lately, even more fun than finding my place of employment highlighted in a magazine, is finding it highlighted in a magazine right next to Shannon’s bar. 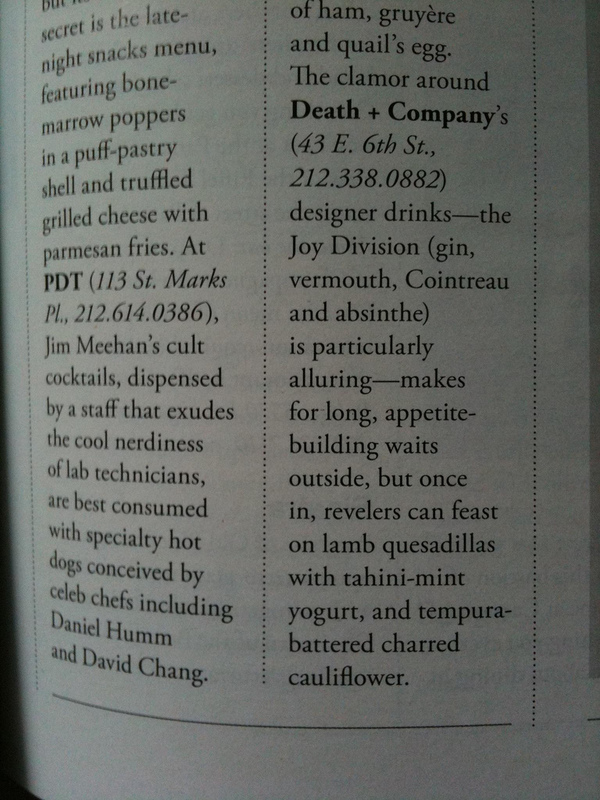 I can’t help but crack up when I pick up Manhattan Magazine and side by side in the ‘best of’ section are both of our places nicely written up and applauded. I’m slowly and painstakingly getting back into running shape. 10 Days: The amount of days it takes for it to not be agony to tie up your shoes and step outside. To be honest the running is more challenging these first few days than during the rest of your current stint, but the truly hard part is just mustering up the will to get yourself out the door. Once you hit the pavement everything else works itself out. Running the streets of New York you always have someone watching you, egging you on, and as great as a motivator as that can be it ultimately turns out every run to be stitch in my side. With an audience you can never just jog, you always have to at least attempt to look fresh and quick. You can’t let an onlooker who you are seeing for all of 12 seconds think you could possibly be tired from running 3 miles in 90 degree heat, and the fact that you live amongst 1.6 million people and will probably never ever again see this random sweaty person again is impossible to fathom at the time. For some reason bravado and style are the only thing you care to exude while on the run, whether you outwardly pull it of or not is… debatable. Transports me straight back to my first cross country race in high school, not having any training under my belt and not quite understanding anything about the sport of running, I preceded to run like hell out in front of the gathered crowd and as soon as I was hidden behind a hill come to a grinding halt and gather myself for the next sprint in order to impress the onlookers. I can only imagine how absurd it must have been to see a sweating, sprinting, and smiling boy whip by you on the course and head out to the next small hill only to reappear again 25 places behind and 5 minutes later. Although I have only been out for a few runs now it has already offered me a real escape from the city. Being able to run along the river into a cool ocean breeze Brooklyn’s factories in the distance, and Manhattans skyline reflecting off the water, it makes it seem as if no one else gets to see what you are seeing. Somehow running makes you feel like you have earned the sight you are soaking in, making it more yours than even the random tourists gazing in the same direction. If anything, the sights alone get me out the door when I am tired after work. Hopefully as these days get busier and busier with the imminent opening of the new restaurant I will continue to have time to run, because I certainly need it with all of the pastries in my fridge. 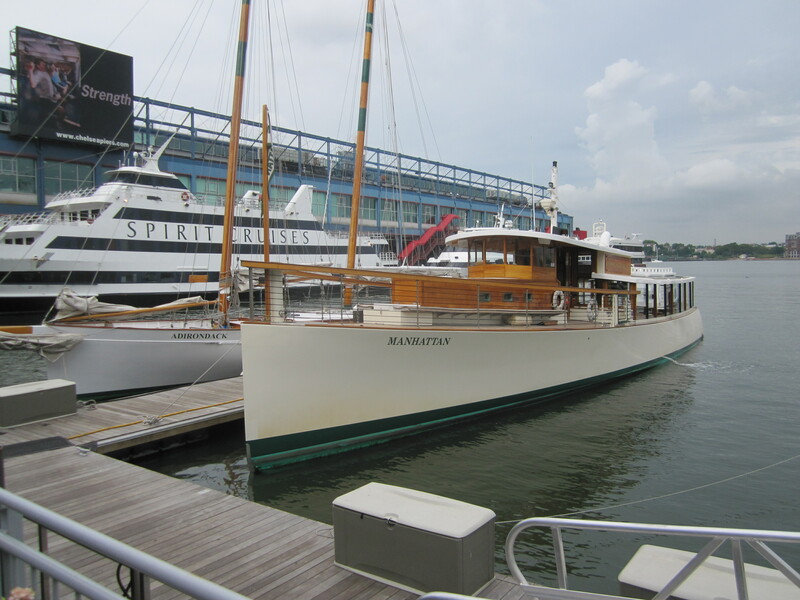 While not quite as eventful as Gilligan’s infamous voyage, Shannon, Jean, Kay, and I did get to take a rather lovely cruise around out island. With Shannon’s mom and aunt in town we decided it would be a good time to take in the sights around Manhattan. Once aboard the yacht we were promptly handed mimosas and quickly kicked out to sea by the captain. Once out on the river the air temperature immediately dropped and we were encased in the cool salty breeze coming off ocean. We began our journey down the Hudson river towards the Atlantic Ocean and the Statue of Liberty. The view from the Yacht was spectacular. Straight from the beginning as we were ushered by the Statue we were continually floated by famous views including the Financial District skyline, the low and neighborhood like Village, the sea ports and forts, and the industrial shores of Queens. We swam down the Hudson river and up the East River, our ever knowledgeable captain spouting off trivia at every turn. 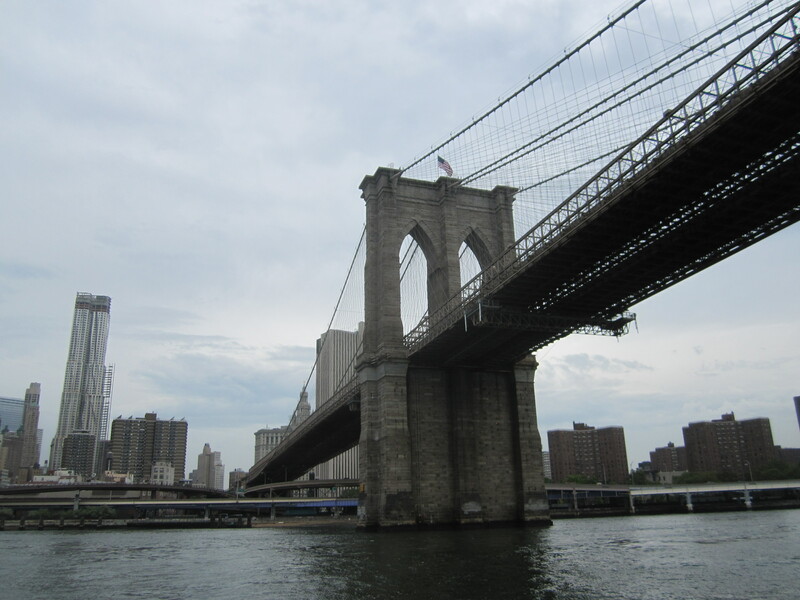 Some of the standout sights glimpsed from new angles aboard our small vessel were the bridges. These colossal stone and iron structures are really neat to see from underneath. It is amazing to me the amount of care that was put into the aesthetics of the bridges, the stone work, the iron work, and then add to this the actual structural intricacies it makes for pretty a pretty awe inspiring sight. Brunch was served in 4 delectable courses, non of which did I think to photograph, and each accompanied by a new mimosa. We were pleasantly surprised by the quality of quiches and freshness of the fruits, but still were distracted by the steady stream of sights ripping by the large glass windows. The whole experience was extremely eye opening, but in particular one section of Manhattan threw me for a loop. As we crested the top of the island about to enter the Harlem River the entire scene turned to something none of us expected to see on the small island of Manhattan: Green. Lots and Lots of Green. As it turns out the top of the island and then into the Bronx is an endless sea of beautiful green forest, gardens, parks, and water. We got only the shortest glimpse into this world from the yacht, but it suddenly made the top of my destination list! It also turns out that we can access all of the greenness from a subway train! It is crazy to me that this area of dense foliage is attached to the urban jungle which I have been trapped in for all this time! It doesn’t compute in my brain, it is just too much of a contrast.